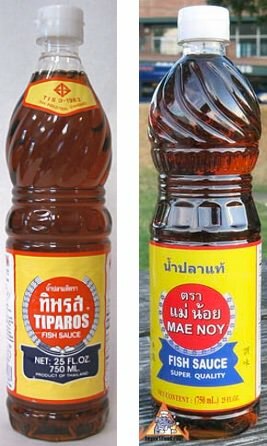 In May 2014 the US FDA stopped allowing imports of Tiparos brand fish sauce. This is our summary of why FDA made that decision, based on records that are available to the public. As a direct importer of food products from Thailand, including fish sauce, we are familiar with the US FDA and how to comply with their strict procedures. In March 2014 the Acting Director of the Office of Compliance, Center for Food Safety, Department of Health and Human Services, sent a "Warning Letter" to the Managing Director of the company that produces Tiparos fish sauce. In this letter, various concerns were outlined which reference an inspection of the facility. Specifically, Tiparos was deviating from the FDA's Seafood HACCP requirements. The letter mentions that Tiparos should monitor temperatures of fish as they are off-loaded from harvest vessels, and improve reord-keeping, among other things. Tiparos did not respond to the letter, so US FDA stopped allowing Tiparos entry through US ports. Tiparos had a street appeal, being the familiar fish sauce served throughout Thailand as an everyday pedestrian favorite. Restaurant chefs love the squeeze bottle for ease of use when cooking. Premium quality, familiar taste, and the best value price. You can see Tiparos in many of our Thai street vendor videos. In 2015 there's a new brand in the maket with a remarkable similarity to Tiparos, called "Mae Noi". This brand is packed in what looks to be the same bottle, and the fish sauce itself has a similar flavor. If you liked Tiparos before, we suggest you try Mae Noi. We believe that Tra Chang brand is more tasty, but many customers know what flavor they like, and they choose the plastic bottle pedestrian flavor of Tiparos. Mae Noi is packed in the same large 25 oz plastic bottle. Ingredients: anchovy extract, water, salt, sugar. Product of Thailand. We also offer four other brands of fish sauce. Panang beef is one of those recipes that everyone loves, whether it's kids or grandparents, college students or anyone else from any country in the world. Rich herbal flavors inspired by Indian influence in Thailand, and adapted to give it a unique Thai flavor. Unlike some Thai recipes that take a great deal of time to prepare, a delicious panang can be made in minutes using a handful of key ingredients. Here we've prepared a simple recipe that's sure to be a popular favorite. It's best prepared with the highest quality coconut milk with higher fat, such as our 100% pure Chaokoh coconut cream. We also have a recipe for panang chicken but beef is probably the best way to enjoy panang. In photos below, notice we demonstrate making panang beef on two different occasions, the second time we usedchee fah chile peppers in addition to red bell. Here is a Thai dish not very common in restaurants, with unique flavor that we know you'll enjoy. To hold the chicken upright, we used a can of 7-Up half-full of soup stock (or use water). When the chicken is placed vertically on the plate and ignited the flames coming from the open body cavity resemble the eruption of a volcano (hence the name). No longer the exclusivity of fancy restaurants, the simple art of flambeing is becoming part of entertaining at home, and this is a great holiday dish.